Possibly one of our most viewed posts here is one about the EcoCity Food Forum held in 2013 by City of Melbourne. It was an awesome day. With this in mind I thought you might like to hear that a followup event has been organised: Sustainable & Fair Food: Going Local. Here's some info about it. Healthy food systems are the foundation for healthy lives, communities, economies and ecosystems. In order to build a future for Melbourne in which we can all thrive, we need a food system that is sustainable, resilient and equitable. Join our special guest speaker and people and organisations from across the food industry working toward a better food system to explore how we can do so by 'going local'. Watch this cool little video about the 2013 event and then get going and reserve a spot. we'll see you there. In the spirit of fostering new connections and renewing old ones we invite you to join us at our first open quarterly social and information sharing evening. We'd love you to join us to meet some likeminded people, to inspire or be inspired by the energetic and knowledgeable people in this network (and the cool stuff they're all doing) plus you get to make some new friends and have bite to eat. We reckon by the end of the night, you'll feel energised and walk away with a clutch of new mates and ideas. What: We’ll start with a guest speaker followed by discussion and questions, then anyone who wants to can briefly share an update on their project or items of interest with everyone present. After that we’ll mingle and eat! Our guest this time around will be Kate Archdeacon who is nearing the end of her research Masters into urban agriculture networks, design and resilience. During her recent fieldwork in post-industrial northern England, Kate saw a city-wide example of urban agriculture that has flourished despite the massive challenges it faces. She would like to talk with MFGN about some of the simple but seemingly effective things that are keeping that program going, and hopefully meet MFGN members who would like to explore these ideas further in a short design workshop. 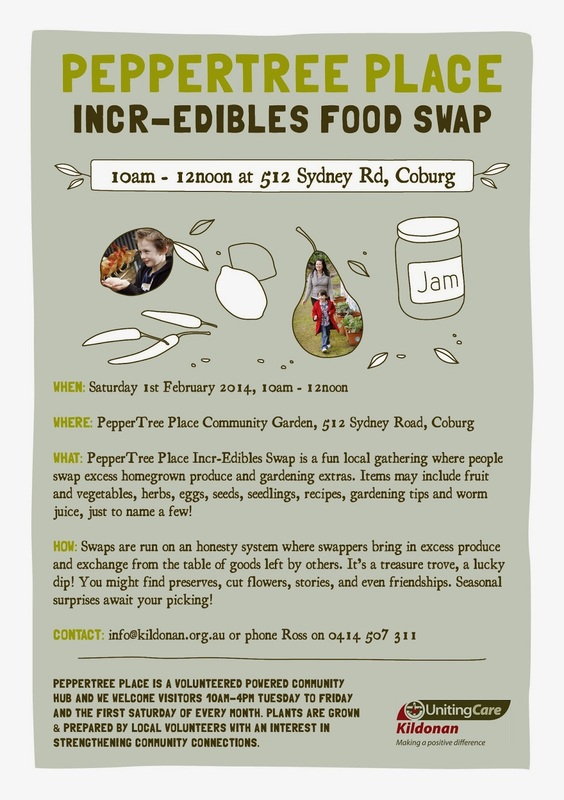 Come and drop in to Peppertree Place and be a part of our first Incr-Edible Food Swap of the year. We are back on board and working towards some exciting events this year, kicking off with celebrating Harmony Day on the 1st February. 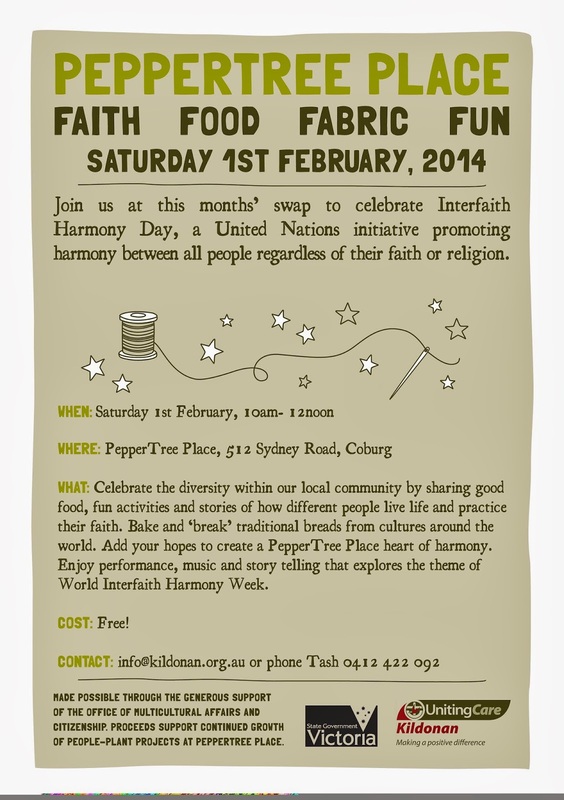 In partnership with the Multicultural Women's Sewing group, Harmony Day celebrates our diverse, local community with fresh food, fabric and fun activities for everyone to participate in. We will have a few local bread experts making, baking and 'breaking' different breads on the day for all to share. Dance and music performance from around the globe will be featured in a celebration of life, promoting harmony regardless of faith and religion. You're invited to a twilight community feast and film screening to celebrate free and fair food in Melbourne. Everyone is welcome! Food will be prepared by the generous volunteers from Brunswick's own amazing Open Table. We're hoping to source lots of locally grown fresh food for the feast (more on how you can help with this below). To cap off the evening we'll have an open air screening of the Growing Food Project a short documentary film that captures a cluster of vibrant stories exploring Melbourne's local food movement and community food initiatives, where people are coming together to build local, fair and sustainable food systems. Written & directed by Rasha Tayeh. Food Donations: we'd love to use lots of locally produced food for our feast and will happily accept donations of surplus produce. Open Table will be able to use anything and everything - they are a creative bunch in the kitchen. Miscellaneous veg, greens, herbs, edible flowers, citrus and other fruits, eggs, even honey if someone is rolling in it! Please only share what you have in excess. We really love giving the fresh produce we haven't used away on the evening in small boxes and paper bags, so there will never be too much! 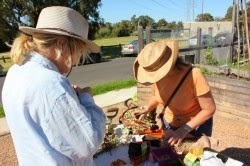 If you can contribute, please drop your fresh food off at the West Brunswick Community Garden by 2pm on Sunday 9th Feb. The Melbourne City Council is seeking citizen volunteers to participate in the Urban Forest Data Collection Project. This community project involves gathering information on the vegetation (trees and shrubs) and permeability in specific parks, gardens and streets. No prior experience is required and thorough training will be provided by qualified instructors both in the classroom and in the field. The data collected will help the City of Melbourne to quantify important benefits from the urban forest such as air pollution removal and carbon storage, monitoring tree health and diversity, and tracking changes occurring over time as the urban forest strategy is implemented. Volunteering is a fantastic opportunity to meet new people, learn new skills and build knowledge across our City. Office training for one hour (learning the steps of the methodology) and site training for two and a half hours (gathering information in the field). How much field time is required? About 3 to 4 hours per session (a morning or afternoon) whenever you are available during the summer period. The idea is to have a number of citizens contributing to make the task easier. Once we have a group of willing Citizen Scientists we will arrange dates for training to occur. Interested in gardening? Excess seeds or seedlings? 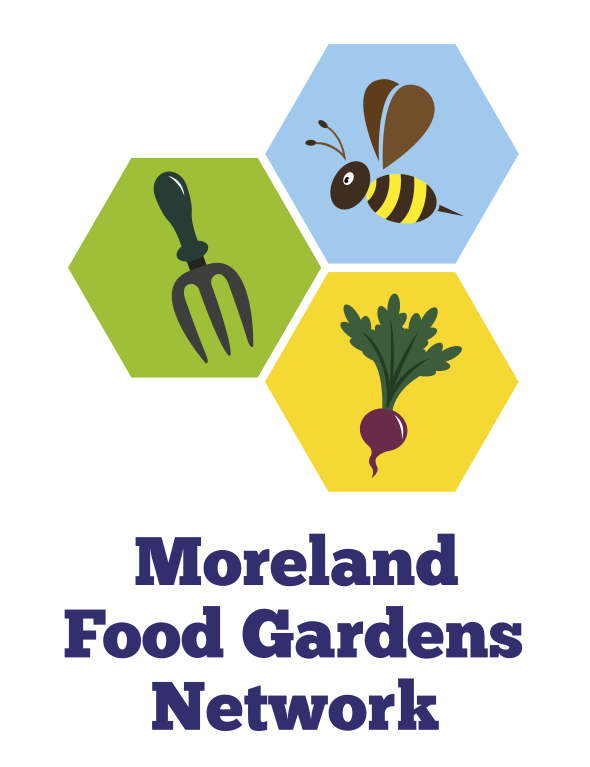 Come along and share produce and garden stuff. Free fertiliser and mulch. Bring your friends and neighbours.